Everyone drinks bottled water here. Well, maybe that’s not true, but most everyone I’ve seen does. The stores are filled with bottled water. Every table in the open air food stall markets is stocked with bottled water. Yet I don’t see much recycling going on. The manager of the hotel told me there was a water refill station near the 7-Eleven. 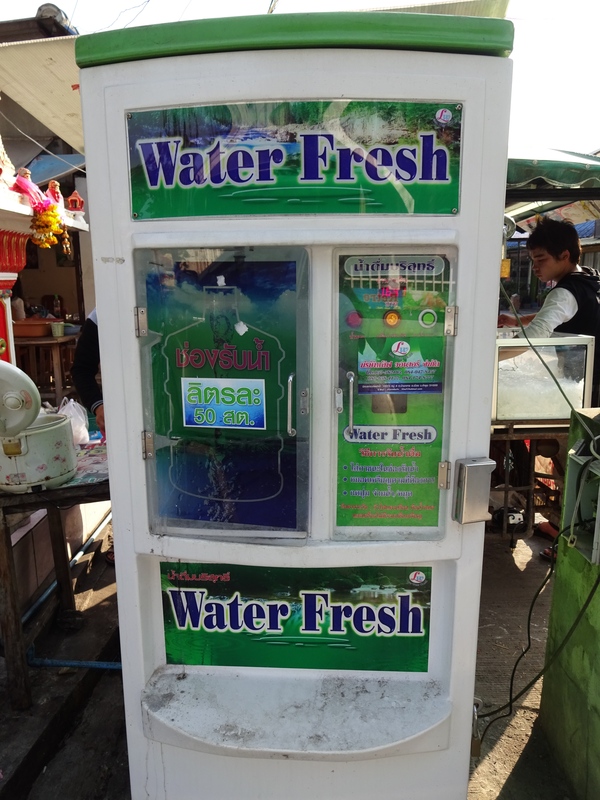 Sure enough, to save money and to buy fewer bottles, there’s a little fresh water unit by the side of the road just like a free standing ATM. So I sidle up with my bottle; I’m cool. I open the little door in front and all the instructions are in Thai-of course. I place my bottle under the spout. I pull out a coin and pop it in the slot. Press the button, water gushes forth, filling my bottle rapidly. But when it’s full and I remove the bottle, the water continues to flow. And this is not a trickle, mind you; this is garden hose force. It’s splashing everywhere. I attempt to stop the flow, pressing the red button and the yellow button again and again. Nothing works. If you’re of a certain age, you know exactly what I mean by mentioning Lucille Ball here. I have no other empty bottle to fill. I close the door, thinking the water will drain out somewhere inside the little cabinet. But no, it begins to flow into the street, continuing with the same force. Now I am looking ridiculous, standing in front of the water-refill station with no bottles to fill, helplessly watching perfectly good water gush forth into the street. I realize, of course, that I have put too much money in the slot—10 baht. A passerby takes mercy upon me and shows me how to stop the flow. Oh, yeah, the green button. Go figure. Through very limited language and mostly sign language, I am informed that 2 baht is all I need for my 1.5L bottle. I paid 5x too much and would have stood there watching the rest lost in the street had I not been saved having to slink meekly away. I am gaining confidence on the road. Today I even passed some Thais. OK, maybe they were just turning left. But the round trip to the pool (one other actual swimmer and two French women sunbathing) didn’t seem so far. You have no idea how it feels to creep up to the very front of the traffic waiting at a major intersection, to be surrounded by cute Thai dolls in their Very Serious helmets, the occasional couple of girly boys with the one in back riding side-saddle, a few bigger bikes, and a bunch of salarymen (that’s Japanese for working stiffs), all watching the timer count down in anticipation—-and then, boom!– they all jump the light by a couple seconds and hurtle off into the open boulevard, leaving me in their dust. Hysterical!! Other times you could be cruising along calmly in a less congested traffic flow and some high-riding, massive BMW comes screaming by ridden by some farang wearing a sleeveless leather vest. Seriously! This place IS a motorcyclist’s heaven. The other day I saw a Thai Harley club roaring by in full regalia. I met a guy at dinner last night who lives in Oceanside and spends about 4 months a year here just cruising all through northern Thailand, the Golden Triangle, the mountains, parks, Chiang Rai. The scenery is gorgeous, the roads are good, the weather is predictable and the traffic is light. What is also most welcome is the courtesy and care evident among Thai drivers. There are traffic rules, after all, and I am finding they are largely kept, along with actual deference to and especially among scooter riders. Probably because we all realize how fragile this whole thing is. There are many many intersections with no signs or lights. Drivers weave their way slowly through each other. Cars and bikes wait for dense traffic to move by before taking their turn. It’s all quite civilized. But me, helmeted, masked, sitting at that light at the head of the line; that is so far away from anyone I have ever been. Priceless. Lunch before eating: the 80% rule. I picked a place to stay about a mile north of the old town. It’s just as dense and busy as the tourist zone, but with far fewer tourists. I’m really quite satisfied with it. I have since discovered that finding places to eat that either include English on the menu or cater to foreigners by including pictures of the dishes are more rare. This has caused me to be a little less comfortable picking just any place to eat. Everything is open air, the cooking style in the food markets is frankly a little suspect, but I’ve had no issues at all so far. What’s interesting is the way Thais eat; two utensils at all times, fork and spoon or chopsticks and spoon. No knives ever. So I’ve been eating away with the fork as usual and mostly just holding the spoon in the other hand as if I know what I’m doing. But today it suddenly dawned on me that I had it entirely backwards: spoon in the left (I’m left-handed), fork in the right. There I was, looking crude and clueless. Use the fork to construct the perfect mouthful, not too big, no dangling bean sprouts or noodles. Do it slowly, with care. Dally with it. There is no hurry about eating. It’s just something we do that has to be done. But it’s boring. Maybe this is why I have not seen any fat Thais. And every dish perfectly adheres to the 80% rule–you cannot possibly get more than 80% full if you eat this. Mix each mouthful perfectly to ration all ingredients (except maybe some of those little nuclear chilis) and arrive at perfect completion at the appointed time, which is not quite now. Everyone knows about the elephant camps.They’ve become a must-see. So today I set out early for a 100km circuit through Mae Sa valley. It’s called the Samoeng loop, a gorgeous ride through mountains (max elevation 3500ft) and small rural villages. The elephant camp is on the way. The camp itself is a very accommodating tourist venue, with a lounge, a cafe, souvenirs (of course), jewelry vendors, a viewing area for the show, a corral for the elephants and another viewing area for the elephant baths. But as I amble in toward the corral, I am immediately offered to buy some bananas and sugar cane to feed the elephants. Tourists are standing on one side of the fence with the goods and the elephants are begging. The trainers are constructing photo poses for the elephants with the tourists. Some of the elephants were not really engaged and seemed to be exhibiting what I would call neurotic repetitive behavior exhibited by animals in captivity. The tourists were being trained to feed and the elephants were being trained to beg. All of this was immediately uncomfortable. Even painful. Looking at the camp brochure, I saw some of the things the elephants were expected to do in the show. I knew instantly I could not watch. Elephants are way too smart to be spending their lives being exploited by people. Watching them get a bath and roll around in the water was another thing. They weren’t chained. And they looked like they were having actual fun. But after 10 minutes, having paid my $7 fee, I had to get out of there. On the way out, I asked the ticked cashier if any of their funds go to elephant conservation. She had no clue what I was talking about. This entry was posted in Personal, Thailand, Travel and tagged bottled water, chiang mai, elephant camp, Samoeng loop, thai cuisine, thai scooters by garyhorvitz. Bookmark the permalink. Hilarious! I can just see you, the environment activist, standing there helpless while the world’s most valuable resource gushes uncontrollably and it’s YOUR fault. Damn those buttons. Don’t they know they are supposed to be in English. But since I was rescued, that meant I paid forward for someone else’s water. I’m OK with that. Perhaps a small enough sacrifice for a pretty hilarious story! I’m glad your WTF moment didn’t involve the scooter. Great great memory-jogging description of the Asian traffic “pattern!” I can almost smell it and hear it. i could not wipe the smile off my face all the way through this. We need to have a scooter-off some day after you return — in Napa or Marin. I still need some time to perfect my u-turn techniques and traffic weaving skills, but you’re on!